Can you tell I’m a huge fan of roasted chickens? And here we are again, with another delicious spin, this time with lots of veggies packed in. Now, I’m sort of conflicted about whether or not to roast a chicken straight in the pan with the veggies. On the one hand, it keeps the chicken tender and moist since it’s nestled amongst the produce…. but then it doesn’t get that lip-smacking ultra crispy skin around the outside. But on the other hand, all the succulent juices seep out of the chicken and baste the vegetables, giving them way more flavor than normal. After a bit of testing, I’ve come up with a pretty great solution. 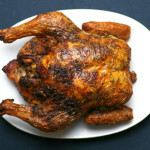 Let the bird cook by itself for a little bit, on high heat, to develop a nice crispy skin. THEN add the veggies, turn down the heat a bit, and let the chicken and vegetables finish cooking together. 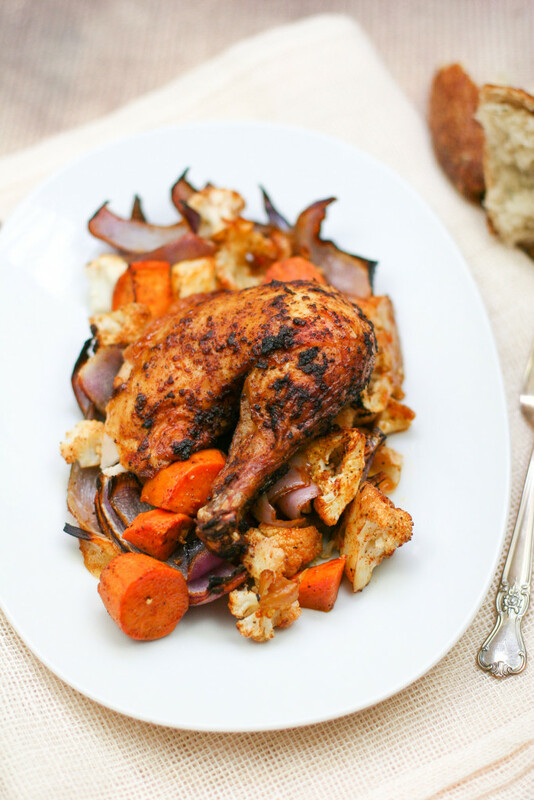 This method = nice crispy skin on the top of the bird, but really tender, fall off the bone meat on the legs and thighs, along with tender and flavorful veggies. As you might be aware, one of my goals for 2017 is to make an effort to serve my food sensitivity clients with my blog posts. 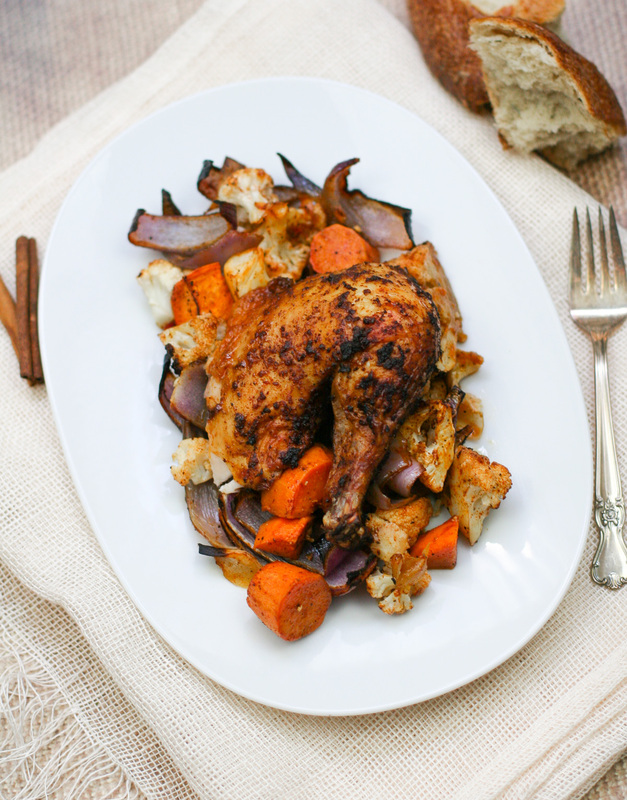 So, this Moroccan Roasted Chicken recipe is 100% LEAP-friendly. 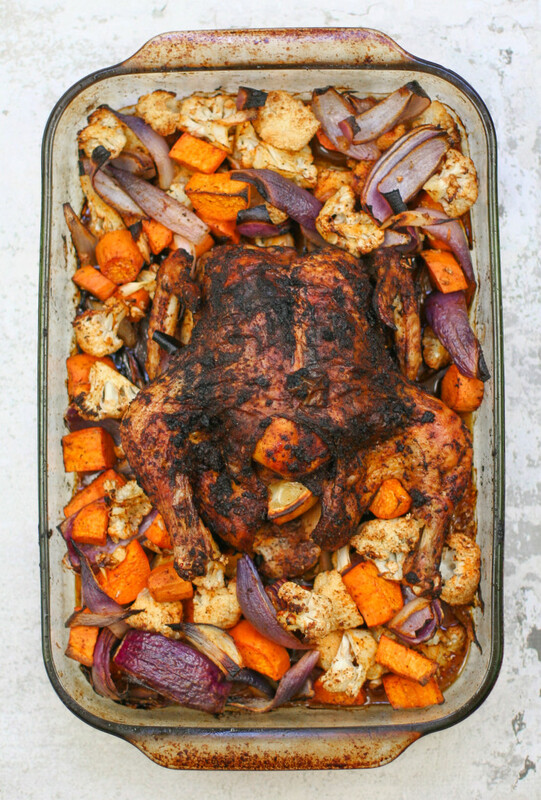 It’s got chicken, leap-tested spices (paprika, cumin, cayenne, cinnamon, and black pepper), lemon, and leap-tested veggies (onion, cauliflower, and sweet potato). Add a little salt & your choice of cooking oil or fat, and you’re good to go. And don’t worry if you have to omit the black pepper. You won’t even miss it with all the spice going on in this dish. My goal is to show that even meals that are prepared with relatively simple ingredients can be mouth watering and taste like a treat. There’s no need to suffer through bland food while in the midst of an elimination diet! So, stay tuned for more creative LEAP-friendly recipes in the future. Preheat the oven to 450 degrees Fahrenheit. Grease the interior bottom and sides of a large 4.5 quart baking dish (usually a Pyrex or glazed ceramic dish) with olive oil or another approved cooking fat. While the oven preheats, remove the chicken from its packaging, remove the giblets from the interior cavity and save for another use or discard. Pat the chicken dry with paper towels, then place it breast-up in the greased baking dish. Carefully slide your fingers underneath the skin on the breasts (starting from the bottom near the cavity), creating a pocket between the skin and actual chicken breast flesh. Wash your hands well with hot water and soap before moving on to the next step. Next, sprinkle the outside of the chicken well with kosher salt (about 1 tablespoon total) and ground black pepper. In a small bowl, stir together the paprika, cumin, cayenne, and lemon zest. Spoon out 1 tablespoon of the spice rub mixture for the vegetables and set aside. Add two tablespoons of olive oil to the main spice rub mixture (NOT the 1 tablespoon you reserved) to create a paste, and rub it all over the chicken. Start with the pockets between the skin and chicken breasts, and then rub the rest over the entire outside of the chicken. If you have any left, you can rub it inside the chicken cavity too. Finally, stuff the lemon quarters inside the chicken cavity, and place the whole baking dish in the oven to roast, uncovered, for 30 minutes. 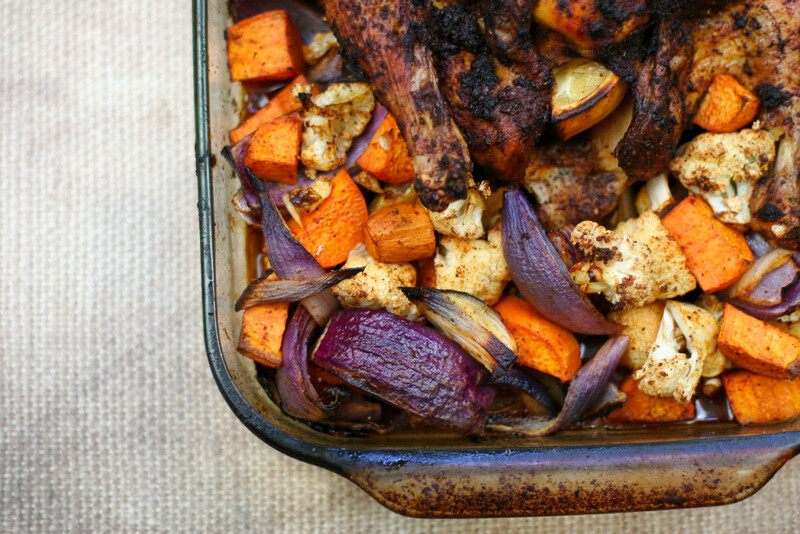 While the chicken roasts, place the chopped sweet potatoes, cauliflower, and onion in a large bowl. 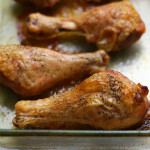 Drizzle with 3 tablespoons of olive oil, and sprinkle generously with kosher salt and pepper. Add the reserved spice mixture to the vegetables, and toss until evenly coated. When the chicken has roasted for 30 minutes, remove the baking dish from the oven and place on a stove-top or heat-proof surface. Carefully spoon the vegetables into the pan, surrounding the chicken entirely. Be careful not to accidentally touch the hot baking dish! When the vegetables are evenly nestled around the chicken, place the whole baking dish back in the oven, reduce the heat to 425 degrees Fahrenheit, and let cook for another 45 minutes. When the 45 minutes are up, use a meat thermometer to verify that the thickest part of the thigh has reached at least 165 degrees Fahrenheit. If it has, then the chicken is done. 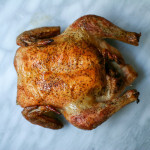 If the chicken has not reached the proper temperature yet, continue roasting until it does. 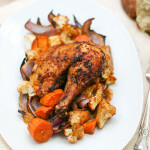 When the chicken is done, remove it from the oven and let rest for 10 minutes before slicing and serving alongside the roasted vegetables and pan juices. Don't miss the goodies I share ONLY with my subscribers! Sign up to get recipes, wellness tips, and exclusive offers sent directly to your inbox each week. You'll love these posts, too! I want to receive email goodies from Erica! Hi! 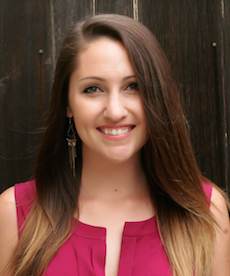 I'm Erica - food sensitivity specialist, whole food cooking enthusiast, and registered dietitian nutritionist. My mission is to help you reclaim your health and vitality by eating REAL food & listening to your body.